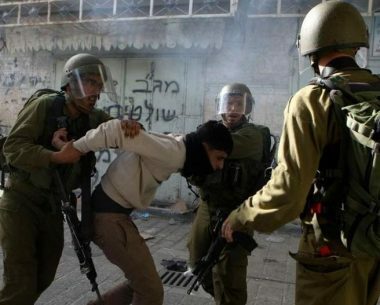 Israeli soldiers abducted on late at night, Wednesday, and on Thursday at dawn, thirty one Palestinians from their homes, after the soldiers invaded and violently searched them, in several parts of the occupied West Bank, the Palestinian Prisoners’ Society (PPS) has reported. One of the abducted Palestinians, identified as Tha’er Shreiteh, who was taken prisoner from his home in the al-Mazra’a al-Gharbiyya village, near Ramallah, is the head of the media department of the Palestinian Detainees’ Committee. In addition, two of the abducted Palestinians are high-school students, identified as ‘Assem Mustafa ‘Orouq and Wawis Mahmoud Ejjawi, from Jenin city, in northern West Bank. The soldiers also installed roadblocks in several parts of the occupied West Bank, stopped and searched dozens of cars, and interrogated many Palestinians while inspecting their ID cards. One of the abducted Palestinians, Nuwwar Bassam Tamimi, 16, is mentally challenged. Omar Abu Latifa, Qalandia refugee camp – Jerusalem. Anas Sa’ad ‘Awwad, Awarta – Nablus. Yassin Sabah, ‘Orif – Nablus. As’ad Amid Ja’ar, Allar – Tulkarem. Ibrahim Tawfiq Jeebat, Allar – Tulkarem. Shadi Bassem Ja’arna, Allar – Tulkarem. Mo’men Zakariya ‘Eneini, Allar – Tulkarem. Ali Ibrahim Abu Oleyyan, Yatta – Hebron. Nuwwar Bassam Tamimi, 16, Deir Nitham – Ramallah. Mustafa Saleh Tamimi, Deir Nitham – Ramallah. Mohammad Mousa Mer’ey, Qarawat Bani Hassan – Salfit.